Thousands maybe millions of fans around the globe will today remember a "singing hero" who dedicated his life to the tango. In 1935, the spotless career of the King of Tango came to a sad end. Carlos Gardel died in his mid 40s in a plane crash in Medellín, Colombia. 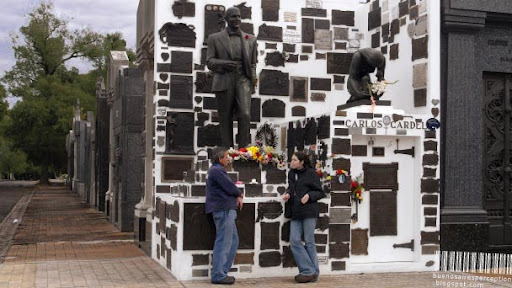 Gardel is buried in the La Chacarita Cemetery in Buenos Aires. His tomb is over and over plastered with bronze memorial plaques and fresh flowers. On top of this his adoring fans provide the lifelike statue with a smoldering cigar ever so often. He truly remains an idol especially for the Argentinean and Latin American fans. If you are interested in more information on Carlos Gardel, I recommend a visit to gardelweb.com. I am glad you reminded us of this anniversary! This is a terrific shot. How good it is to know that artists are sometimes remembered in this way. He must have been wonderful. I'll try finding some of his music. I fail to understand this kind of adoration over a singer, but I do find it fascinating! How many people, I wonder, find some meaning in life through the long-dead? Very interesting about Gardel (and the tomb too). The dark plaques against the white background create an interesting mosaic. I love watching tango...though I really know nothing of it's history and background. but I love it when people interact with street art. How cool to give him a cigar! That's fascinating. This entire white corner is his? And what's the other statue (looks like a lady kneeling) all about? I sure wish I could Tango. What a fantastic monument! I must admit that I am unfamiliar with Carlos Gardel, but I will try to learn more. Love the perspective of this photo. His music is wonderful. I wish I had known were he was buried as it seems that Chacarita is as beautiful as the famous Recoleta Cemetary where Eva Peron lies. I recommend a visit to his birthplace, also in BsAs to see his humble beginnings.